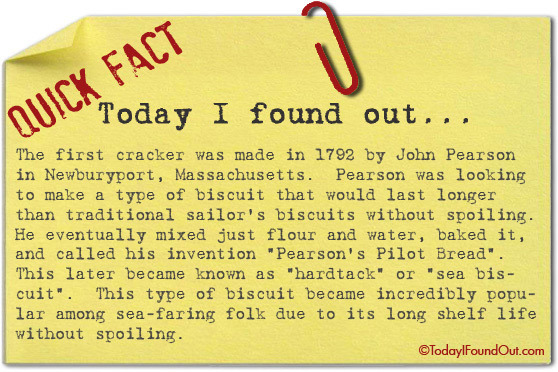 The first cracker was made in 1792 by John Pearson in Newburyport, Massachusetts. Pearson was looking to make a type of biscuit that would last longer than traditional sailor’s biscuits without spoiling. He eventually mixed just flour and water, baked it, and called his invention “Pearson’s Pilot Bread”. This later became known as “hardtack” or “sea biscuit”. This type of biscuit became incredibly popular among sea-faring folk due to its long shelf life without spoiling. Why is the first Cracker in america at all? Not considering Matzo in Egypt?